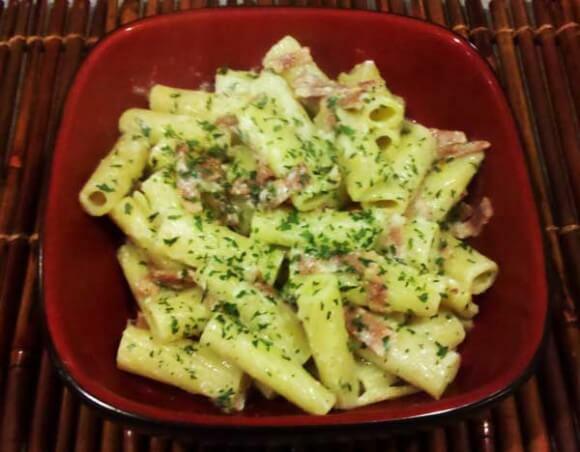 Rigatoni Alla Carbonara – A Creamy, Garlicky Pasta With Wine and Bacon! Today I’m bringing you one of our favorite pasta dishes! Are you ready??? Its a creamy, garlicky, pasta with wine and bacon, called Rigatoni alla Carbonara!! Its super delicious, has tons of amazing flavor, AND is super easy to make~! Who doesn’t love that??? Whenever we make this dish, it smells like Olive Garden in our house, so its also wonderful for entertaining! Just add some garlic bread and a Caesar Salad, and you’ve got a restaurant-quality meal!!! Goooooood Morning WEDNESDAY my beauties~! How is everyone feeling??? Our sun has slowly faded, and we’re now dealing with clouds and rain. But we’re used to that, here in the Northwest! And the rain hasn’t “rained” on my spirits – I’m feeling rather “SUNNY” today~! Today I’m bringing you the complete review of the Broadway ImPress Manicure, as well as part 2 of the “ImPressive Manicure” article that I posted on March 12th! I’m SO excited to bring you this article because I’m now on my second Broadway ImPress Manicure, and have been wearing them steadily for almost a month straight! I’m feeling not only comfortable with putting them on, but I feel like I’ve also picked up a few tricks along the way! How is everyone out there in cyberspace? Its a beautiful, sunny day and its finally starting to look like Spring is arriving~! My tulips are starting to sprout, and my Cherry Blossom trees are starting to blossom – ahhh, its gorgeous~! Today I’m bringing you the second part to my ULTA Shopping trip, with a review of 2 of Loreal’s HIP Eyeshadow Duos!!! If you remember from the “Wet n Wild Palette Review – Ulta Beauty Haul Part One“, I got some amazing deals while shopping there. Consequently, I went there shopping for something totally unrelated to eyeshadows, and came out with several~! That’s what happens when you take a trip to their clearance section, and find some super cute items, AND end up having manufacturer coupons on top!!! It all adds up to some irresistable deals~! How was everyone’s weekend? We had a fun weekend! My Mom came into town for a couple of days, and we celebrated my little one’s birthday on Sunday! Needless to say, its been a busy weekend, but a great time was had by all! It started out on the wrong foot, with my little one getting the flu, but by Sunday he was on the mend and fully enjoyed his birthday celebration! So today I’m bringing you a review of a couple of Wet n Wild’s palettes: Part 1 of my Ulta Beauty shopping haul! I went shopping at ULTA last week and found some amazing deals, including a couple things on clearance! And when you factor in manufacturer coupons and ULTA’s store coupon, it equals AMAZING deals~! Who doesn’t love ULTA?? ?